Zilina is the 5th largest city in the Slovak Republic. Situated some 200 kilometres from the capital Bratislava, it serves as a logistic and industrial hub for the north-western parts of the country. 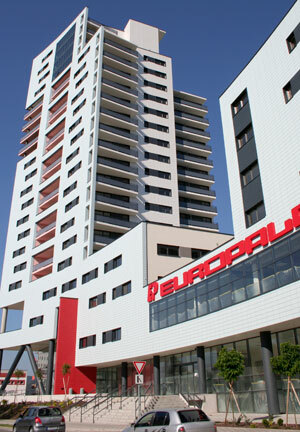 Recently, a multifunctional complex – Europalace – has been erected close to the city centre. Substations from Alfa Laval were selected to deliver the heating and hot tap water to a number of high-standard apartments. The overall solution presented by Alfa Laval is a representative example of “community heating” – i.e. small-scale application of district heating technology. Europalace complex stands as a symbol for modernity and architectural achievement. It also represents a bold step in urban planning. The complex includes a number of apartments as well as premises for commercial activities. Residents have close access to shopping and sports facilities. This "convenience factor" is a pillar of the Europalace concept, as is the high level of comfort offered in the apartments. Obviously, the heating system has to meet very high standards of comfort, efficiency and reliability. It is also expected to minimize the environmental footprints. – We had formed a solid relationship with Inkur Martin during previous projects. Our local presence was strong and we could offer short delivery time. Needless to say, the Mini City turned out a success factor in itself. It is easily installed, highly effective and practically maintenance-free. The solution for Europalace provides a good example of small-scale application of district heating technology. Even at a modest scale, this technology can offer a set of benefits that are highly measurable. In this case, the structure of the network is indeed uncomplicated. The heat source of the system is a gas boiler and the Mini City substations are installed on vertically ascending pipes providing hot water. From this position they will distribute water horizontally to the heating circuit and tap water system in each individual apartment. Substations are metered and can be tuned to serve the needs of each individual household exactly. With premium heating comfort defined as a fundamental requirement, the selection of Mini City seems natural already from this perspective. This substation offers fully automatic temperature settings for both central heating and hot tap water. This means, that a temperature curve can be preset to match the actual need of the individual household with great accuracy. Since metering is individual, residents pay for the energy actually used and get an incentive to save energy. Domestic hot water is heated separately in a high-capacity heat exchanger, thus ensuring that the hot water is always fresh. – The high thermal efficiency of the Mini City is well documented, both in our laboratories and in a number of installations in various countries. It is designed specifically for this kind of small-scale application. It is robust, uncomplicated and compact – and is consequently very popular with installers. I think it will serve extremely well within the Europalace complex, where the functional demands are severe and well defined. Alfa Laval will deliver the Mini City substations, providing the heating and tap water supply for the 128 high-standard apartments at the Europalace complex.